SUBHEAD: Those arrested argue saving the planet justified illegal sand pipeline shutdown. 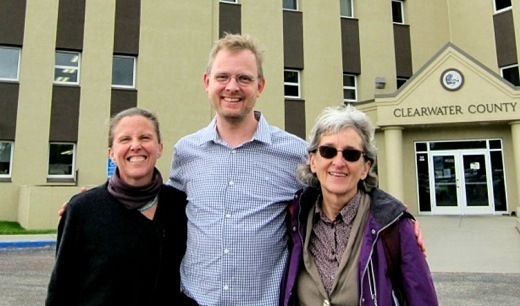 Image above: A trial for (from left) Emily Nesbitt Johnston, Benjamin Joldersma, and Annette Klapstein regarding their participation in a 2016 multi-state protest begins on Monday. From original article. "If we really go out there and sit down in front of the machine, eventually they can no longer operate it. And at this point, that is our only option." Rejecting a challenge from state prosecutors in April, an appeals court ruled that the "valve turners" can present a "necessity defense"—and bring in top climate experts to testify. In June, the Minnesota Supreme Court denied prosecutors' petition to appeal that ruling. The necessity defense "is a plea that, yes technically we committed a crime, but we did it to prevent a greater harm," explained Annette Klapstein, a retired attorney from the Seattle area and one of the valve turners on trial. "We cannot work through our political system, because its values are nothing but profit," she told The Nation. "We live in an oligarchy, not a democracy." "It's very much in the interest of the capitalist political system to make us feel powerless, to make us feel that we can't do anything," she added, but "ultimately, they cannot win if we do not consent. If we really withdraw our consent, if we really go out there and sit down in front of the machine, eventually they can no longer operate it. And at this point, that is our only option." Klapstein and Emily Nesbitt Johnston are facing felony charges under Minnesota law for shutting down Enbridge Energy's Line 4 and Line 67. While Benjamin Joldersma, who assisted them, also faces charges in the case, the state has dropped trespassing charges against videographer Steve Liptay. The Nation reports that Princeton political scientist Martin Gilens and Harvard Law School's Lawrence Lessig are among the expert witnesses slated to testify. Dr. James Hansen, a former NASA scientist who has been called "the father of modern climate change awareness," and 350.org co-founder Bill McKibben will also testify in case, according to the activist group Climate Direct Action. "These people deserve our respect and support," McKibben said on Twitter about the valve turners in Minnesota on Friday. This will be the first of the valve turner cases where those on trial can present a necessity defense, as judges in three states have barred fellow activists from doing so. In Washington, Ken Ward was found guilty of second degree burglary after his first trial ended with a hung jury. The judge used a "first-time offender waiver" to sentence him to two days in jail, which was fulfilled by time in custody after he was arrested for the 2016 action. In North Dakota, Michael Foster was convicted of two felonies and a misdemeanor, and sentenced to three years in prison, though he only served six months and was released in August. Sam Jessup, who livestreamed Foster's action, was convicted of a felony and a misdemeanor, and received a two-year deferred sentence with supervised probation. In Montana, Leonard Higgins was found guilty of a felony and misdemeanor. He received a three-year deferred sentence. Kavanaugh to Earth - "Drop Dead!"